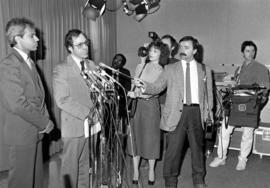 Photograph depicts Jack Silverstone and Irwin Cotler, co-counsel for the CJC before the Descenes Inquiry, holding a press conference. Oral history interview with Gerald Lecovin. 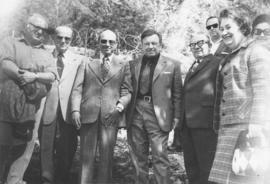 Photograph depicts (l-r) Bernard Cherrick, Yigael Yadin, Allan Bronfman, Michael Greenblatt, Q.C., and Mr. Justice Samuel Freedman. Photograph depicts a formal portrait of Harry Walsh.